What Is the French Attitude Toward Dining Out? Before you begin working your way to foreign language fluency, it helps to understand the culture behind the language you’re learning. After all, language exists to help a group of people express their ideas and beliefs. France is an old country with a rich history and culture. As you begin your French language program, gaining a strong grasp on this history, the values, and the etiquette will help you rapidly achieve success. In particular, the French have a strong focus on the dining experience. France also has a passion for food, which is something the rest of the world has come to appreciate and rival. Children in France are raised to appreciate fine dining, so by the time they are adults, they’re well versed in the dining experience and have a distinguishing palate. The French love of good food and fine wine leads them to eat most meals out at reputable restaurants. Even the family dog may come along to enjoy the experience. Trying out a new restaurant or a newly created dish is something that particularly excites the French. After tasting the new meal, they relish in discussing and critiquing the food and dining experience. In 1765, a Parisian named M. Boulanger invented the modern-day restaurant. He created restorative brews, which he termed his “ristorants” and sought a place to serve them to patrons. This is how the term restaurant came to be, as Boulanger’s establishments became popular for regular socializing among the Paris people. Even among French businessmen, the love of fine dining is appreciated. Business dinners place an emphasis on the meal first delaying formal discussions until coffee is served. During the meal, topics such as the best place to pick wild mushrooms may become equally as important as trade negotiations. Napoleon is said to be the exception to the rule, since he usually finished eating a state dinner within 20 minutes and left the room. Bringing this up to modern Frenchmen may inspire a defensive response. “Ah, but then he was a Corsican!” they may exclaim. 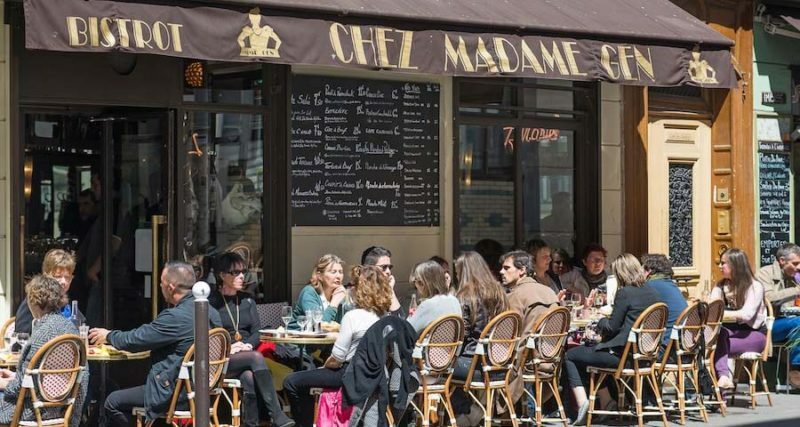 Stopping by a neighborhood café is a common practice for much of French society. While coffee is served at every café, they also serve other beverages from teas and soft drinks to alcoholic beverages. The busiest times for most cafés are early morning and midafternoon hours, when patrons can meet for breakfast or lunch. Many patrons will then stick around to drink coffee, while they read the newspaper, watch television, or observe the people walking by the café’s storefront. Among the more popular menu items offered by traditional French cafés are croissants or brioches, “croque-monsieur” (cheese and ham on toast, add a fried egg on top and it is a “croquet-madame”), and sandwiches that consist of “jambon” (ham), “fromage” (cheese), and “rillettes” (pork spread). In the summer months, “citron pressé” (fresh lemon squash) is a popular item and is typically served with sugar or a sugary syrup for sweetening. Most French cafés are complimented by a nearby kiosk, where other non-food items can be purchased. This is where you can get phone cards, bus tickets, tobacco products, lottery tickets, postcards, and stamps. Paying for these items requires a specific methodology. Instead of handing a clerk your payment, cash is placed in a try on the counter; change is given back to the customer in the same way. This ensures a more exact accounting of what funds were exchanged. The French may pick up a between meal snack at a snack bar, café, or crêperie. Here, they may pick up a “crêpe” (a sweet or savory pancake), a “galette,” or tea and cakes. Conversing about food and drink is nearly as important as the act of dining itself in French culture. Whether it be about a particular vineyard’s current crop, or the new twist added to the “foie gras” at a local restaurant, discussions centered on gastronomy are as ubiquitous as restaurants themselves. Examples abound regarding the importance of cuisine in France. Two rather offbeat and somewhat disturbing examples involve Louis XVI and Francois Mitterand. Before his execution during the French Revolution in 1793, Louis XVI had three soups, four entrees, three roast dishes, four sweet courses, fancy cakes, three compotes, three fruit dishes, Champagne, Bordeaux, Malvoisie, and port wines, followed by coffee. Truly a last supper fit for a king, n’est pas? Prior to his death in 1996, records show that President Mitterrand celebrated le “réveillon de la Saint-Sylvestre” (New Year’s Eve) with his family and close friends by consuming three dozen oysters, two ortolans (small birds), as well as foie gras and capon, all only days before he passed. In true French style, the President was a dedicated gourmand until the very end.